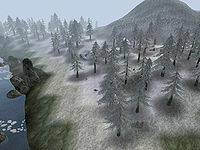 The Isinfier Plains are the central tundra on the island of Solstheim that stretches from Thormoor's Watch in the west to the eastern coast, between Thirsk and the Hirstaang Forest. The Moesring Mountains, Lake Fjalding and the Isild River form the northern border and Bloodskal Barrow, Brodir Grove and the Sun Stone form the southern border. Most of the Isinfier Plains are covered in snow and frequently endure savage blizzards especially to the north, near the Moesring Mountains. Flora in the region is diverse and includes Belladonna, Holly, Solstheim Pine trees and several species of shrub just to name a few. However, it is the fauna in the region that is what makes the Isinfier Plains an excellent hunting ground. Various species include the common grizzly bear, snow bear, common wolf, snow wolf, tusked bristleback, grahl, white horker, draugr, ravens and Rieklings. The unique river systems and sheltered bays of the Isinfier Plains makes the region an excellent place for various smuggling operations and camps for reavers, berserkers, Fryse Hags and hunting parties of the Skaal and Thirsk. Many people call the dozens of ice caves in the Isinfier Plains home. The area also includes magnificent tombs like the Jolgeirr Barrow. The Altar of Thrond is located in the north of the Isinfier Plains, on the banks of the Harstrad River. After the Red Mountain erupted in 4E 5, Isinfier Plains became the border between the southern ashlands and the northern, intact part of the island. In 4E 201, the reconstruction of the Temple of Miraak began in the region, but was left incomplete after the defeat of Miraak by the Last Dragonborn. For game-specific information, see the Bloodmoon article. This page was last modified on 28 November 2017, at 01:22.